A speaker who sounds like the IS leader seems to refer to recent North Korean threats against Japan and the US. He also talks of battles for IS strongholds like Mosul, which was regained by Iraqi forces in July. The last time he appeared was to preach at the Great Mosque of al-Nuri in Mosul after IS overran the city and a "caliphate" was proclaimed. Asked about the audio, a spokesman for US forces fighting IS, Ryan Dillon, said "without verifiable evidence of his death, we have continued to assume that he is alive". A defence department spokesman told the BBC: "We are aware of the audio tape purported to be of Abu Bakr Al-Baghdadi and are taking steps to examine it. While we have no reason to doubt its authenticity, we do not have verification at this point." The militant Sunni Muslim group IS, which earned notoriety for its brutal violence towards civilians and prisoners, has been steadily pushed back in Iraq and Syria this year. Can IS survive killings of its leaders? The 46-minute recording was posted by a website with links to the group and is the first such speech to appear since November. As well as Mosul, the speaker refers to battles in Raqqa and Hama in Syria, and Sirte in Libya, saying the bloodshed would not be in vain. He also talks of Russian-brokered peace talks on Syria. Much of the tape consists of religious references. Baghdadi may be hiding in territory still controlled by IS along the Iraqi-Syrian border. Less than a handful people would know his whereabouts, Hassan Hassan of the Tahrir Institute for Middle East Policy wrote in a recent article for BBC News. That makes it hard for the US, which has dedicated special forces constantly on the look-out for him. In June, Russia reported that it was "highly likely" Baghdadi had been killed in a Russian air force strike on Raqqa on 28 May, and an Iranian official asserted he was "definitely dead" shortly afterwards. However, claims of his death had been made before and the reports were treated with scepticism by US officials. 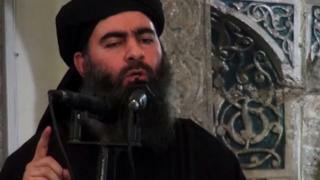 So the IS leader al-Baghdadi is still alive, or at least it appears he was still alive at least as recently as August. This concurs with the views of western intelligence agencies and Iraq's government, which were always sceptical of Russian claims to have killed him an air strike. His apparent survival to date will give some small morale boost to the beleaguered IS fighters still clinging on in Raqqa, but it is unlikely to make any strategic difference. Like the al-Qaeda leader Dr Ayman al-Zawahiri, the IS leader is so circumscribed by the need to keep his location secret that he communicates rarely, and is unlikely to be in a position to personally direct any ongoing operations - other than to give them his blessing.